Ya gotta make it because you’re having a dinner party or company. Or maybe you have a very simple side like a sauteed chicken breast or oven baked salmon. Or maybe because it’s a full moon. Or not a full moon. Or it’s a Monday. Or not a Monday. You get the drift. Make it for whatever reason – just make it. I can’t even remember who I stole this Easy Cheesy Broccoli Skillet off of! I think it might be one of the little cooking videos my Sis is always posting on Facebook. They make me crazy coz I usually look at those posts right before bed and I swear they make me hungry! I gotta get with it and do some videos myself! I keep saying that! But this Broccoli Side is absolutely amazing over the top deliciousness, video or not. I hope I’m not spoiling anyone’s diet, here. Heck, you’ll probably gain weight just by looking at the pics! That’s why whatever you’re serving it with should be not too over the top itself unless you’re in all out party mode. But doesn’t that Broccoli look good in my favorite red skillet in all that cheese? There’s a little cream in there, too, I’m afraid. It’s like a Broccoli Cheese Soup but in a more concentrated form. I could see doubling this recipe and using it for a Thanksgiving or other dinner party side, too. As long as you’ve got a burner and the oven available. The Easy Cheesy Broccoli Skillet is actually only in the oven for about 10 minutes and that cheese is so molten hot (I don’t know if you can actually see the steam in the pics – it looks like grey smudges) that it will stay warm for a beat, so it can wait a bit before serving. I burnt my poor little tongue on the first bite! Easy Cheesy Broccoli Skillet is incredibly simple and absolutely fool-proof. It’s not like all those dishes where you have to make a roux or a white sauce and so on. The broccoli is sauteed until crisp-tender, a little garlic is added, then the cream goes in (you don’t even stir it) and it’s topped with cheese. Pop it in the oven, like I said, for 10 little minutes. Done. I do want to note that I didn’t use quite the full amount of broccoli so mine looks a bit cheesier. I had a craving for Lo Mein the day before and stole some if the broccoli destined for this dish to put in it. What can I say!! I was only short about a cup. But with the full amount of broccoli, it wouldn’t be quite so over the top decadent. Or maybe a cup of broccoli doesn’t make all that much difference, lol! The recipe calls for three kinds of cheese. I look at it like this: one for flavor, one for melty stretchy, gooiness and one to rule them all. That last is Parmesan, the king of cheese, right! And that’s gotta be the worst Tolkein pun, ever. But the Parm goes on top so it gets nice and golden brown and delicious. I used part Mozzarella and part Cheddar but you could go more down home with a Colby Jack mix or maybe a little more sophisticated with a white Cheddar and something like a bit of bleu cheese. Anything your heart desires will work as long as it will taste good with the Broccoli. Did you know that fresh broccoli is almost always cheaper than frozen? If you hit a good sale on the frozen (stock up on frozen veggies in the fall – they’re usually at a low) and have coupons that might vary. But you need to keep in mind one critical factor that no one ever tells you. Generally, for every pound of frozen broccoli you buy, you will end up with 10 ounces of broccoli and six ounces of water. Doubt me? You can do the same experiment. Thaw out a pound and measure that green water left behind after you remove the broccoli. The green is a lot of the nutrients, too, all gone to waste. That’s some pretty expensive water. So shop well for your broccoli. I used to shave the stems before cutting them, now I just cut them thinly on the diagonal and I always toss them in to cook two or three minutes before the florets. They’re really the best part if you just give them a bit of a headstart. When reheating this dish, do so very gently, especially when using the microwave. If not, the cream and cheese will separate and leave you with pools of oily substance. You can stir it back together and it will taste ok, but it IS off-putting. Try the defrost or 70 percent power button. In a large oven-proof skillet, heat oil over medium heat. Add the broccoli stems and cook for two to three minutes, stirring now and then. Add florets and cook for another three or four minutes, stirring as necessary until tender/crisp but still bright green. Add garlic and cook for a minute longer. Season with salt and pepper, keeping in mind the cheese will add a bit of saltiness. Remove skillet from heat and pour heavy cream over broccoli. Do not stir. Top first the Cheddar and Mozzarella, then top those with the parmesan. Bake until cheese is bubbly and broccoli is tender about 10 minutes. If the cheese hasn’t properly browned, place under broiler for a minute or two. I’ll be posting Easy Cheesy Broccoli Skillet and co-hosting at Fiesta Friday Blog Party #238 with Mikaela @ Iris and Honey. If you have a minute, do stop by and check out Fiesta Friday and Mikaela’s very lovely site! I know you’ll love them both!! This entry was posted in Click here for Fabulous Food Posts and tagged Broccoli, cheddar, Cheese, Cream, Mozzarella, parmesan, Side, Vegetable Side. Bookmark the permalink. Thanks much! We LOVED this cheesy goodness! Great recipe. I love cheesy broccoli dishes. Also a useful tip regarding re-heating, but I doubt there’d be any left to reheat in our house. Thanks Ron! Sorry I missed your comment. And this is so good, it’s hard to not just devour the whole thing like a pack of hungry wolves, lol! Thanks. This is one of my fave dishes this year, I think! 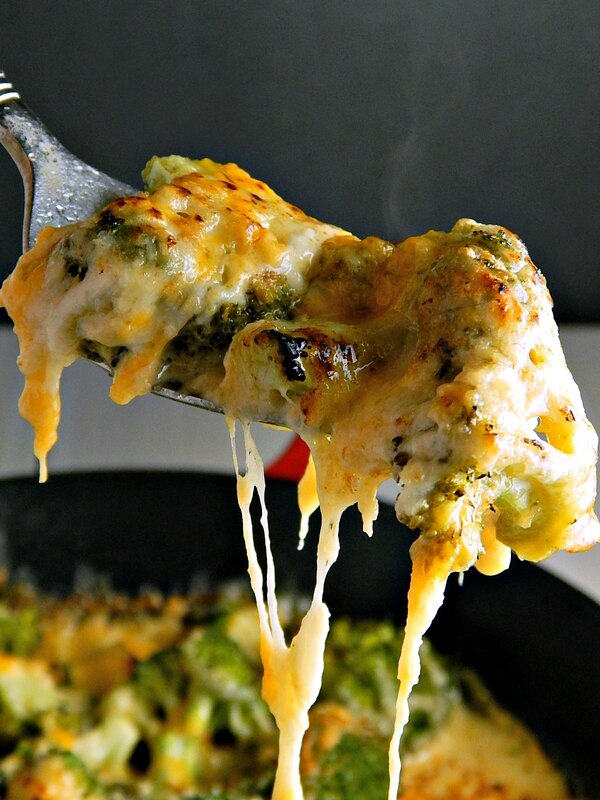 Cheese and broccoli are a match made in heaven and this looks delicious! We have a head of broccoli in the garden that needs harvested and our cheese drawer stays well stocked. This is happening! Yes, I know you’ll love it – well, what’s not to love, afterall! Looks delicious and it is keto friendly. Win/win!